While working with hot metals I realized that I did not have a good way to know the temperature. My cheap IR meter only went to 1,000°F (540°C). I only knew the temperature of the steel when it started to de-carbonize. A good IR thermometer costs between $500 and $900, and this is a lot of money for most people. I realized one night that I could tap into the iPhone's camera and analyze the image. I spent the money and bought an expensive IR meter, developed an algorithm and calibrated the iPhone app to produce the correct temperature based on the irradiated color. that can be easily selected. 100 degree increments. 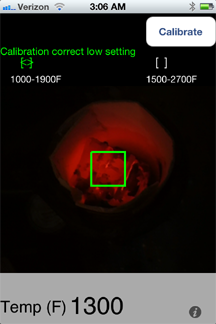 Below are images taken within an induction coil heating steel and a wood fire showing simulteaneous temperature readings from an optical pyrometer and Thermal Light..
One must realize that the app measures color temperature. This means that a white piece of paper will read a "hot" temperature. The readings only make sense when the source of color is from radiating light from a hot object. A black object will read zero degrees. Once it gets above 1,000°F it will start to emit a dull red light and the app will begin to show a true temperature. Copper, for example, can give inaccurate readings when cold as it has a dull, reddish luster. Once it gets near 1,000°F it will blacken, and then start to glow. 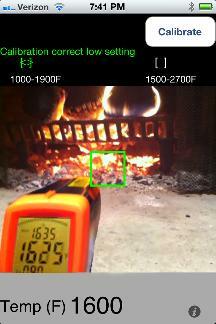 You can aim the camera at your forge and read the temperature at various points. Ambient light does not affect the app. You can take readings in dark or lighted surroundings. The only thing that matters is that you fill the green square with the object you want to sample. There are many uses for this app in industry, metalwork, glass blowing, ceramics, and hobbies. For under $6 U.S. you can get a reasonably accurate tool that can reproduce readings from an expensive IR thermometer or pyrometer. You can download the app, Thermal Light, from Apple's App Store. Induction Heaters: The author has built induction heaters up to 10kW and has several Induction Heater videos on YouTube and a tutorial web site on building induction heaters. There is a lot of theory as well as how-to. You have to be very seriously into electronics to build an induction heater. 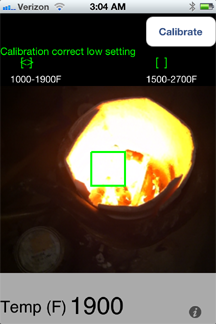 His work with heating metals led him to write this iPhone app. 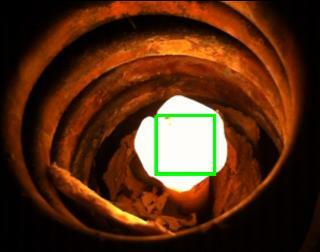 LEFT: Bolt heated to 2,500°F in Induction Coil. Infrared: Jonathan says this works using white light only. However, I have noticed that standard digital cameras are affected by infrared light. Objects in the low red range show up in a purplish hues that are brighter than the human eye sees. From an article on digital infrared photography. The latest digital cameras are sensitive to infrared light, so much so that manufacturers place a hot mirror filter in front of the sensor to block infrared light to prevent infrared IR light from spoiling regular photographs. It is still possible to shoot digital infrared photography with an unmodified digital camera . . . So while the camera is not supposed to register ifrared they do so at high temperatures and this probably has some effect on ThermalLight (for the better). GRAV - Verticality or Level (the sensor for the screen to display UP no matter how it is rotated). MAG - Magnetic Flux direction and intensity. EMS - Electrical Field Strength via the Wi-Fi information. SOL - A solar activity monitor via Internet connection. Who knew these little hand held devices were becoming almost as sophisticated as the much larger clunkier fictional Star Trek Tri-Corder? There have been other Tricorder apps that mostly made a toy of the phone with pretend medical scanner screens sound effects and so on. But this one is reporting REAL information. It may not be highly accurate but it IS information derived from the phones surroundings. Thermal Light is a real world "Tricorder" application with real world value. I should not be surprised. I have a pocket calculator sized digital Multi-meter that I bought 20 years ago. It is smaller than my old TI-30 SLR (the ones with the little vinyl fold open slip cover) that easily fit in a shirt pocket and about the size of the current "thin" cell phones. This little meter measures AC and DC voltages from 600V down to chip logic level and resistance to tens of thousands of Ohms just like a big desktop meter. It is like many of these devices in that you can hold the leads when set on Ohms and watch your heart beat in the display changes. I used to sneek it into nuclear power plants to test the electrical connections to machinery we supplied. I carry it in my laptop bag and I am more apt to use it than either one of my regular size multi-meters. A big part of these devices is the LCD display, supporting electronics and memory. The current crop of high tech commmunication devices now have color display screens and memory that rival the huge desktop VGA screens and hard drives of 20 years ago. With that overhead taken care of there are all kinds of additions that can be made using minor electronics. Perhaps someone will find a way to plug multi-meter leads into a cell phone access plug and read voltages. . . OR a phone maker will add ports and supporting electronics for the purpose. From there the proper app could display an EKG type output of your heat beating. . .
CBS, Current owner of everything Star Trek sent Google a DCMA take down notice for the Andriod Tricorder app and Google quietly caved. The supposed infringement was over the "look" of the screen, not the name "Tricorder". Apparently CBS thinks bars with curved corners, no matter how original the art, are a Star Trek trademark. Did they EVER show a Tricorder display in any Star Trek episode OR movie???? Did we make a mistake rounding the corners on our pages like almost everything new on the web? Apparently Gene Rodenberry, creator of Star Trek, gave a public license to anyone developing real work technology based on Trek tech. But CBS dissagrees. At least if it has round corners. . . There IS an "official" Star Trek iPad app called PADD (Personal Access Display Device). But apparently it has recieved terrible reviews. . . So what else will we be able to do with our UED's (Universal Electronic Devices? An IR sensitive camera (unfiltered or optionaly filtered) could do non-contact temperature measurements including body temperature similar to the way Thermal Light does high temperatures.. The Multi-Meter addition would make it an electronics tester and add EKG capability with the right software (yep another app). What else? Currently they make hand held laser spetrometer metal alloy analyzers or XRF (starting at about $30,000). Imagine one of these reduced to chip size and built into our UED (formely Tricorder). Induction Heater Videos on Youtube More Jonathan Kraidin projects. Omega Temperature Measurement Metering components, references, pyrometers. The Art of Firing By Nils Lou. Designing and building ceramic kilns and furnaces.